In Poland, the technique of fabric printing evolved from potato stamps to immense print works in Łódź. Culture.pl explores the history of the craft. The first printed fabrics appeared in Western Europe around the mid-6th century (the oldest specimen found in Arles dates back to 543). The material reached the continent from the Middle East as a side effect of the Arab conquests or through the trade route leading from Egypt. The fabric arrived in Eastern Europe chiefly from the Byzantine Empire. The first printed textiles called naboyka appeared in the Rus’ in the 12th century. Primitive printing techniques involving the use of potato, turnip and beetroot stamps gave way to more durable wooden stamps cut with higher attention to detail. Then patterns chiselled in wood were replaced with metal plates and short nails in order to achieve finer lines and small dots (18th century). The 17th century initially saw the rise of copper plates etched into reliefs, and then also intaglio. From 1850, hand printing was completely replaced by mechanical printing. In 1834, Perrot patented the perrotine, a machine intended for flat printing using wooden and copper plates. Now printers could print patterns in 3-4 colours. However, not long after, flat printing was taken over by the much quicker and efficient rotary print. This is also the date which marks the demise of many small printeries operated manually. The ones which survived worked for small towns and villages up to World War I.
Poland was influenced both by Western and Eastern Europe. Poland’s Eastern part adopted Ukrainian and Belarussian technologies. Its Western part used wooden blocks, mainly from Germany. The Polish fabric printing industry didn’t blossom until the reign of Stanisław August Poniatowski (in the second half of the 18th century), who included in his political platform giving Polish industry a stimulus, resulting in the opening of the first workshops in Poland. Polish craftsmen were taught by specialists, chiefly Italians, brought in from abroad by the king. Printed fabric workshops popped up in big urban centres, but also in small towns. Silesia and Pomerania, in particular, became overwhelmed with new business to the point of a part of printers being forced out the eastern border in search for jobs. This period saw the dawn of the textile industry in Łódź. Yet, at the same time, nomadic village printers offered their services in areas deprived of new technologies. They printed using wooden blocks, boards and templates cut out in metal sheets, so-called ‘patrons’. Women would wear malowanki [printed fabrics had various names in villages: malowanki in the Lublin region, wybijanki in the Podkarpacie region and nabojki in the Rus’], i.e. canvas skirts printed with dark-blue patterns. They brought pre-whitened canvas to Jewish printers in cities, chose a pattern which was then painted on the material. The patterns were cut in metal sheets, covered with dark-blue or yellow oil paint and impressed on stretched canvas. After lifting the plate, the work was done. Once the pattern dried, women would sew sturdy skirts fit for working, since they didn’t get as dirty as white canvas skirts. The patterns would come in all shapes and sizes, a different one in each village. It wasn’t just about aesthetics, as they were also practical – the patterns partly hid stains. Patterned and colourful outfits came late to rural areas – in the mid-18th century. The Spring of Nations was one of the factors of change, as it brought the abolition of serfdom and allowed peasants to gradually become richer. Beforehand, the inhabitants of rural areas could not afford to go to a printer or a dyer, so their clothes came in the natural colour of linen canvas, which was sometimes whitened. Small workshops handled villages and small towns, such as Jan Buszek’s works in Muszyna, Chałaciński’s in Żywiec, the Klein family’s in Międzyrzec, and several printeries belonging to the Stein family in Lower Silesia. As the profession of fabric printer was often hereditary, their patterns were used for a long time, which led to some regions using particular ones repeatedly. Over time, these patterns contributed to building local recognisable identities. Clothes canvases were dyed with natural pigments or coloured with oil paints by using the so-called ‘patrons’ to impress the pattern. While oil paint would successfully hold onto the material when coating chests, it worked poorly on canvas since it didn’t impregnate the fibres. The effect didn’t last for long, and soon after, the paint would start to crumble and fall off. The paint wouldn’t survive laundry at all. However, at the peak of printed canvas’ popularity in the 19th century, this fact was not actually that important, since laundry was often limited to undergarments and shirts. Worn out clothes with fading patterns were turned into children’s clothes and grain sacks. Peasants in the 19th century saw these decorative fabrics as a testimony of advancing up the social ladder and evidence of a certain wealth, while for other social strata it was just a substitute for luxurious materials, both embroidered and woven with intricate patterns using gold and silver threads. Printed fabrics, especially in the Middle Ages, were popular precisely for their capacity for ‘imitating precious textiles’. Written in the 15th century, a manuscript from St. Catherine’s convent in Nuremberg is evidence of this in its description of transferring glittering patterns onto printing blocks. However, one of the most typical medieval prints is signillis ornatae, a powder-based technique using silver and gold that was used in Europe until the end of the 16th century. Printers would put a layer of glue on a textile and diffuse metal dust onto it. It is difficult to conclude if the materials embellished in that fashion were deemed as exclusive as the ones embroidered with gold and silver threads. Nonetheless, it took much less time, and it was precisely this quickness which acted in favour of printing. This was why printed fabrics always evolved in parallel with other techniques for adorning textiles, like embroidery and weaving, jointly influencing global fashion trends. The Polish nobility were clearly influenced by the phenomenon of replacing precious textiles with printed materials. Their clothing and the technique used to adorn it was a visual symbol of the financial standing of its wearer. Polish noblemen wore clothes sewn from materials produced on their estates by their peasants, however, when they left for visits or to take part in sejmiks (regional political assemblies), they wore clothes sewn from materials manufactured by professional craftsmen. However, it did not mean that Polish noblemen wore printed fabrics, but they did wear printed robe belts. Wealthy nobles wore exquisitely-woven silk belts. 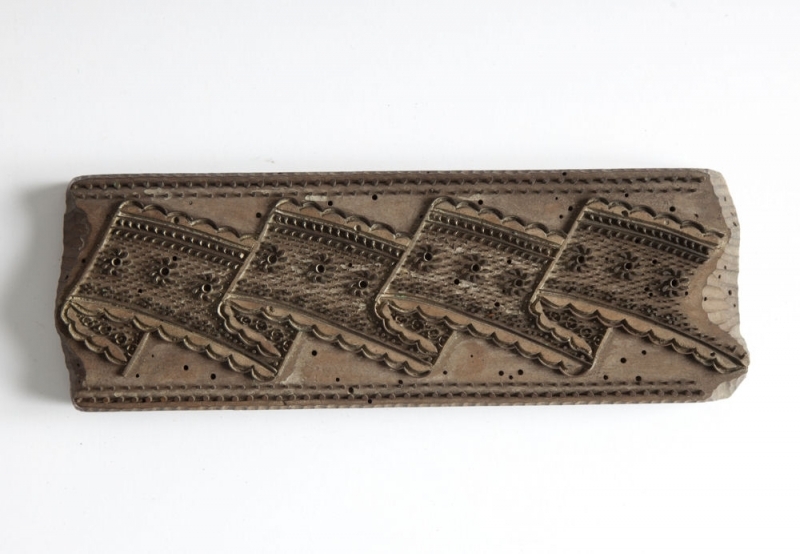 Impoverished noblemen and the bourgeoisie wore printed belts made of linen and cotton, which were made all over the country from the second half of the 18th century onwards (for example in Niemirów). In 1833, Ludwik Geyer, an entrepreneur from Łódź, imported the first rotary pattern printing press. It included wooden cylinders covered with copper and brass sheets drawn by craftsmen and graphic designers, which were, at first, etched into reliefs, and later through intaglio. Originally, the cylinders were etched by hand, and later, pantographs. New technology offered much bigger opportunities – it considerably accelerated the process of printing, many more colours could be printed, and after exploiting a pattern it could be etched into a new one. What is interesting, as well as using the machines, craftsmen still produced impressions manually – they were probably responsible for smaller issues and occasional prints like handkerchiefs depicting holy places for pilgrims. Printing works offered many patterns typical of neighbouring villages – the materials sold on markets and fairs enjoyed immense popularity. In 1846, Geyer owned 16 printing tables, four machines powered by horses and 110 cylinders – a broad range of patterns and a fierce competition for smaller workshops. But how have all these traditions influenced the current generation? Over the last 5 years, we've seen an intense return to the art of handicrafts. An ever larger part of society wants and has the opportunity to surround itself with beautiful objects. Trends for the local has become ever greater, thanks to which Polish applied arts has been developing and sought out by an increasing number of consumers. In much the same way there is a recognised Polish School of Posters, it would be hard not to deny that there is a developing Polish School of Fabrics including brands such as Pan Tu Nie Stał, Chrum, Gryfnie and Slavica. It seems, for designers and printers of fabric in Poland, as they carry on in the traditions before them and meld them in new ways, the future is increasingly bright.